Why choose PDS for orthodontics? The American Association for Orthodontists recommends that every child have an orthodontic evaluation by the age of 7. Early detection and treatment gives your child a much better chance for natural and normal smile development. By working with natural growth instead of against it, you can prevent problems from becoming worse, and give your child a healthy smile that lasts a lifetime! In the first phase, the orthodontist is interested in the position and symmetry of the jaws, future growth, spacing of the teeth, breathing and other oral habits which may result in abnormal dentofacial development if left untreated. In the second phase, the orthodontist will be looking at how your child’s teeth and jaws fit and function together. Your child’s teeth will be straightened and their occlusion (bite) will be properly aligned. Attention will be given to the jaw joint (TMJ), the facial profile and periodontal (gum) tissues. By undergoing treatment in the first phase, orthodontists can usually reduce the amount of time needed for braces. 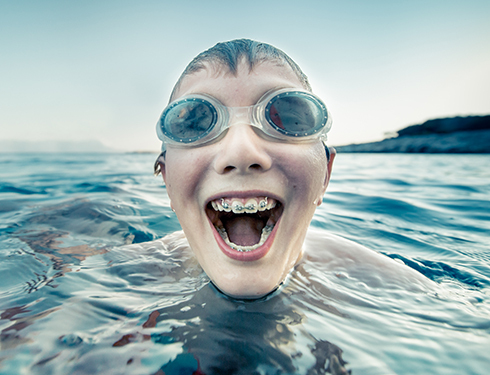 Facial Development -75% of 12-year-olds need orthodontic treatment. Yet by age 12, 90% of a child's face has already developed. By guiding facial development through the use of functional appliances, 80% of the issues can be corrected before adult teeth are present. Cooperation - Children between the ages of 8 and 11 are often much more cooperative than children between the ages of 12 and 14.